There is more information available on this subject at Moon on the English Wikipedia. "We once looked to the Moon and saw hope. Now we see only the power of the Darkness." "The fight to take back all that has been lost—begins here." The surface of the Moon appears to be shattered with immense fissures in the crust spewing a sickly yellow miasma, hinting at the utter destruction going on deep beneath the lunar surface.The Hive have been buried within the moon for centuries, growing stronger within its lifeless core where they have carved their kingdom. Since the end of the Twilight's battle,a consequent Fallen presence has been encountered there in the form of the House of Exile. "We gave up the Moon to keep the Hive away from Earth. We hoped that would be enough for them." During the Golden Age, the Moon served as an outpost for supporting humanity's colonies across the system. The remains of an Accelerator and Moonbase can be found, used to deliver supplies to the colonies. The moon once housed a thriving human colony of interconnected bases, but now only broken domes and scattered space suits half-buried in the lunar soil mark humanity's faded dominance. After the Collapse, the Moon was overrun by the Hive. Guardians attempted to take back the Moon in a disastrous battle that resulted in thousands of Guardians slain by Crota. Exploration efforts were repulsed, reporting increased enemy activity, and even strange tectonic phenomenon. and the moon is currently classified as a Forbidden Zone, accessible only to the most experienced Guardians. The forces of the Hive have now fully infested Earth's satellite, and pieces of the surface have cracked and broken off into space. An iconic view of the looming Earth hangs in the skybox, but Guardians would be wise to keep their eyes closer to the ground. A massive fortress known as the Hellmouth gapes open where the Hive have begun their dig, and sprawling networks of caves and fortified strongpoints wait inside. On the surface of the Moon, forgotten treasure hide in the dust. The recent discovery of the Hive's deployment of Hive seeders on Earth, launched from the Moon, has forced the Vanguard to rescind their decision to principally avoid Lunar territory. Fearing further incursion, the Vanguard have begun sanctioning strikes against key Hive personnel and assets. Following the discovery of the Black Garden, the hive god Crota, Son of Oryx began to reawaken. This was preceded by the reappearance of Eris Morn an agent of The Hidden and member of the First Crota Fireteam originally assumed to be deceased. Following the instructions of Eris, the guardians were able to destroy the crystal containing the Soul of Crota and prevent his reemergence in the material plane. This instigated the opportunity to directly enter the Hellmouth and begin Crota's End. When Oryx and the Taken arrived in the system new activity began in the hellmouth. The Guardian traveled into the hellmouth once again to claim a piece of the crystal that held the Soul of Crota, only to find it an empty shell. Hoping to make use of the dead god's essence the guardian infiltrated the death ceremony of Crota using cloaking technology stolen from Rasputin, narrowly escaping the throne world thanks to the powers of Eris Morn. During the Red Legion occupation of the city and Ghaul's capture of the traveler, the guardians on Luna lost their light. According to Vanguard reports "Hive populations remain low and grow ever lower thanks to the efforts of a small contingent of veteran guardians who have made their homes on Luna". During a patrol guardian on Luna found an unknown object lodged in the chest of a thrall that caused hallucinations when picked up, described as sharp, dark and slippery. The arrival of the Drifter and Gambit has caused a reduced guardian presence on the frontiers, according to the praxic Warlock Aunor Mahal "in the absence of light, even the Hellmouth on the moon is stirring". 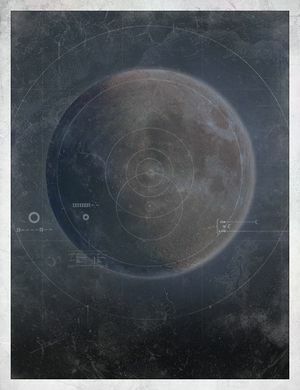 The Moon is the smallest explorable area in Destiny. That being said, its size is deceptively larger than the map would suggest, as the Hellmouth contains a large number of underground chambers. Before the release of Rise of Iron, the Moon was the only location where Taken didn't spawn in Patrol zones; the Plaguelands have no Taken. The Moon as seen on Bungie.net. The Moon as it is seen from Earth. Guardians on the Moon as seen in the Law of the Jungle trailer.